On Frontline: Why Is It So Hard for Doctors to Talk to Patients About Death? Dr. Atul Gawande just wanted to give a patient some hope. But he ended up saying something he would regret. 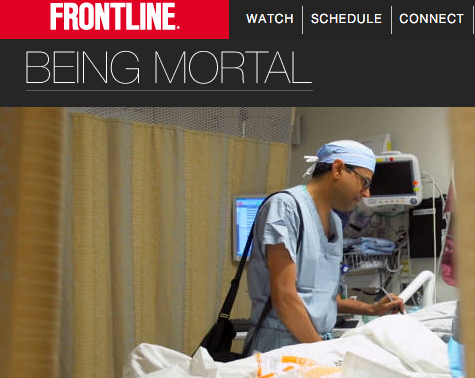 In FRONTLINE’s new film Being Mortal, Gawande remembers treating Sara Monopoli, a woman who was diagnosed with Stage IV lung cancer at 34, in the ninth month of her pregnancy. After giving birth to a healthy baby girl, Monopoli was diagnosed with a second disease: thyroid cancer. In the film, Gawande tells Sara’s husband, Rich, that he knew she would almost certainly die of lung cancer, but he still gave the family hope that an experimental treatment might help treat both cancers. Rich surmises his family’s hope must have been infectious. The conversation captures the dilemma suffered by doctors, families and patients with a terminal illness. The patient faces a painful decision: Whether to keep fighting a disease through every last treatment, trying to live as long as possible, no matter how painfully, or to live out the final days as well as possible. On ‘working’ from the hospital or nursing home.